This REVERSIBLE sliding triangle top is made from the highest quality sublimation print, using Polyester Lycra, with 'maneater swimwear' digital CALL GIRL print. 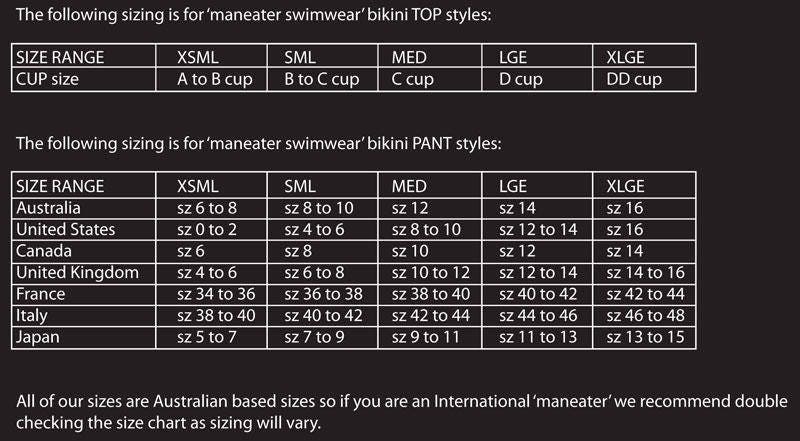 The other side allowing you to be a little more conservative.....not that 'maneater swimwear' knows how to do that! High quality RED matt nylon lycra is teamed with a BLACK overlay. Complimented with matt nylon RED bind ties on the of the cup & underbust it allows the wearer the adjust the coverage of this top. Show either of your personalities in this bikini top. One day your feeling as naughty as a CALL GIRL and the next like a ROCK STAR! Stand out from the crowd! Be original......get all the boys DIGITS wearing 'maneater swimwear' CALL GIRL!